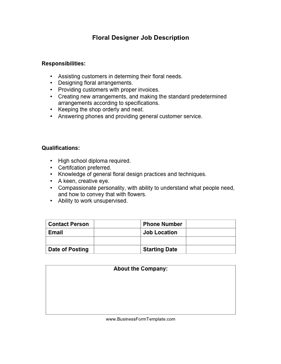 Flower shops and decorators can use this floral designer job description to train or hire new employees. Assisting customers in determing their floral needs. Providing customers with proper invoices. Creating new arrangements, and making the standard predetermined arrangements according to specifications. Keeping the shop orderly and neat. Answering phones and providing general customer service. Knowledge of general floral design practices and techniques. Compassionate personality, with ability to understand what people need, and how to convey that with flowers.